Medical Marijuana For Dogs: Should Your Aging Or Sick Canine Use Pot? (Damian nDovargaes/ Associated Press ) - In this photo taken Thursday, May 30, 2013, Companion Cannabis, by Holistic Therapeutics, a Marijuana medicinal tincture for dogs and cats is seen at La Brea Compassionate Caregivers, a medical marijuana dispensary in Los Angeles Thursday, May 30, 2013. Stories abound about changes in sick and dying pets after they’ve been given marijuana. There is a growing movement, led by Los Angeles veterinarian Doug Kramer, to make it more widely available. Others, however, urge caution until there’s better science behind it. Can you picture your dog reclining on the sofa, remote in paw, and giggling for no apparent reason while scarfing potato chips? While this isn't Fido's typical evening at home (if it is, may your video go viral! ), it could be if you and your pooch are approved for the use of medical marijuana. 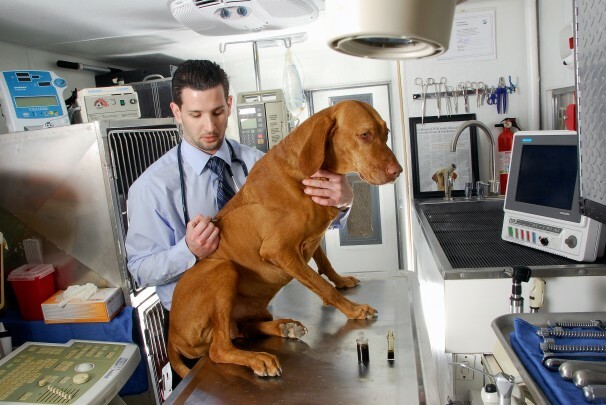 All kidding aside, there are a number of veterinarians who believe that your dog should have access to appropriate doses of cannabis to ease a variety of medical ailments, just like humans do-although some vets are more enthusiastic than others. According to this article published just yesterday in the Washington Post, one vet from Los Angeles is out front and outspoken about his belief in the benefits of canine cannabis: Doug Kramer says that he "...grew tired of euthanizing pets when I wasn't doing everything I could to make their lives better...I felt like I was letting them down." He gave his own Siberian husky, Nikita, pot to ease her pain after tumor removal surgery, which he said gave him six extra weeks with her. And during that time, Nikita stopped whimpering, "started eating, gaining weight and meeting him at the door again." But being outspoken about the use of an illegal substance can have its drawbacks (even though marijuana is legal for human use in 19 states, it remains an illegal drug under federal law). A number of veterinarians interviewed for this article, and who are proponents of the use of pot to ease pain and to improve other quality of life symptoms in dogs, declined to be named in this article "for fear of arrest or retaliation." We know where we stand on this issue: If medical marijuana can be approved for human medical use in specific cases, it should also be available for our dogs. We would love to hear what you think! We are not sure at all. Hmmm food for thought. Have a fabulous Friday. Let's keep the comments coming! So far we;ve got one of each! I love my dogs and I'll try all my best to save their life but by using the pot sounds so wrong and weird. It's so hard to explain why I'm against it, but I am. I work in a pharmacy and see people (and pets!) on things from tramadol to morphine and even opium. My lab was on dialaudid (similar to morphine) when he was suffering from osteosarcoma. But even so, I don't think I'd be okay with medicinal marijuana for my pets. And the fact that it isn't legal has nothing to do with it. I just don't know why! but in small doses, it might be OK. I'd want the vet to know what he/she was doing though before deciding.